World Radio Day is celebrated every year on 13th February around the world to celebrate radio as a medium for entertainment, information, and mode for communication. On World Radio Day, United Nations Educational, Scientific, and Cultural Organization (UNESCO) organizes different activities with broadcasters, organizations, and communities around the world. World Radio Day marks a global celebration of radio as a forum for information and entertainment that helps to bridge the communication gap for remote communities and empowering people. World Radio Day also provides an opportunity to honor the radio’s importance and to bring communities together and in promoting positive dialogue for change. 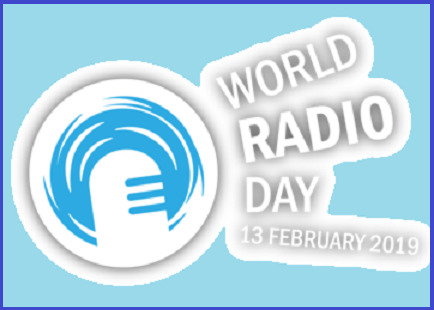 World Radio Day was first celebrated by UNESCO at its 36th General Assembly on 13 Feb 2011. It was therefore adopted as an International Day by the United Nations General Assembly (UNGA). On this day in 1946, United Nations Radio had transmitted (broadcasted) its first call sign. The first WRD was officially celebrated in 2012. India’s celebrated its first world radio festival on 13th Feb 2018 at the UNESCO House in New Delhi organized by International Association of Women in Radio and Television (IAWRT) in partnership with UNESCO with the theme 'Radio & Sports'. World Radio Day 2019 Theme is "Dialogue, Tolerance and Peace".